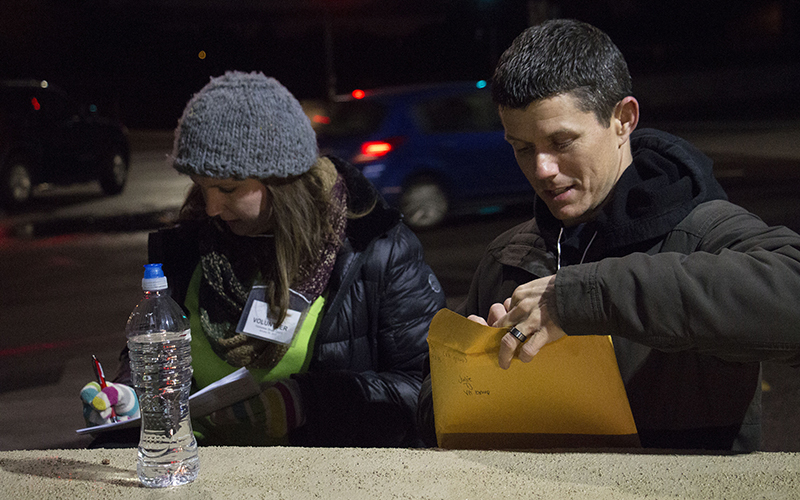 PHOENIX – Armed with clipboards, surveys and layers of clothing, hundreds of volunteers loaded into cars before 5 a.m. on Tuesday with a mission to connect with the homeless as part of the the Point-in-Time homeless count in Phoenix. 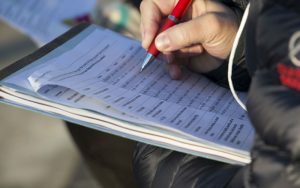 To comply with the U.S. Department of Housing and Urban Development’s count requirement, the Maricopa Association of Governments rounded up volunteers to walk the streets in cities throughout the county to identify at-risk populations. HUD has required counties to participate in the street counts since 2007, but Phoenix has held an annual count since 1999. HUD defines a homeless person as someone living or sleeping in a place not meant for human habitation such as a park, car or on the street. The survey helps identify what types of people are experiencing homelessness and what kind of support they need. Volunteers also count those staying in shelters and other outreach programs. In 2016, there were 5,702 homeless people in the county, 1,646 of which were unsheltered, according to the Maricopa Association of Governments. These numbers help the government secure funding from the Continuum of Care Program for local programs such as Community Bridges Inc. TJ Howard, outreach manager for the southern region for the nonprofit, traveled from Tucson to volunteer with the Maricopa County street count. Volunteers walk through each city and approach homeless people, ask them questions and offer support. A few months after the count, the Maricopa Association of Governments releases its annual report that breaks down the overall density, age and demographic of the homeless population. Anne Scott, the Maricopa Associations of Government human services planner, said the organization sends the report to Congress, which allocates funds through Continuum of Care. This funding allows organizations to offer housing aid and rent assistance to the homeless people they meet during the count. Betty Jean-Rider, one of the women surveyed for the count in Phoenix, said she appreciated the volunteers’ efforts as she had recently become homeless. She said she had slept in a tunnel the previous three nights. Jean-Rider lost her job, which caused her to become homeless. But others chose to live on the street. Despite being offered housing and benefits, Steven Irvin had been living on the streets for more than a year, traveling from state to state on public transportation. Howard said he volunteers because he can witness the immediate impact his efforts have on an individual’s life.